I have some not-so-fond memories of people giving me advice while I was pregnant. They ranged from "stop eating until your pregnancy nausea goes away" to "You and your husband can still go to the movies. Just take the kids with you in their infant carriers!" Uh...okay? The truth is, there is a lot of really good advice out there from more experienced moms, and also a lot of advice that has absolutely nothing to do with raising multiples. I know these people are well-intentioned, but it has made me very aware of giving advice myself. I don't know the first thing about raising singletons. In many ways, I imagine it's harder (how do you entertain a single child all day??). On occasion, I'll get a chance to visit with one of my singleton mom friends and the topic of rearing kids will come up. We will start swapping stories about babies and their reflux or teething, or toddlers and their climbing or obedience issues, and my friend might ask me what I think about something. My first response is always, "I don't know anything about raising singletons, so what might work in my situation, won't necessarily work in yours." Friend: I'm pregnant! But don't worry, I still want to come help every week. Me: You are?! That's awesome! I'm so excited! So every week, we will take a picture of your belly so you can see how fast you grow! Friend: .Uh...Rebecca, normal people don't change that much week to week. If you take a photo every week, you won't see any change. Once a month photos makes more sense. Haha! It just didn't occur to me because I had significant growth every week! So let me get this straight: You go to the hospital, have a baby, and then leave three days later with the baby? Goodness, as much as the NICU was really difficult, I had nurses who held my hand for three months and taught me how to do everything from bathe to feed to dress my babies. I also knew that they had been checked up one side and down the other which was a huge comfort. I can't imagine walking out the doors of the hospital with my three day old baby and being left to figure it out on my own. Seriously, I can't figure this one out. I don't work outside the home because childcare would have been three times my salary. I do work from home as a blogger and freelance writer, but it's very part-time and after the kids are in bed. How in the world do you mamas work outside the home and maintain your awesomeness in the evenings and on weekends? I honestly don't think I could do it. I think the stress alone would knock me out. Those of you who can coordinate all of that have my admiration! In my dreams, I can send my kids into a play place or gym and comfortably watch them play. Instead, whenever we go out in public, I inwardly cringe and have to talk myself down. I'm terrified of germs. Flat out, 100% terrified. If someone sneezes or coughs, I freak out. Runny noses? So scary (and I know most of the time it's teething!). I'm aware that most of those fears come from having NICU babies, needing to scrub in to see them, use hand sanitizer whenever I touched them, and being on lockdown for two winter seasons. I've asked other multiple moms when the fear goes away....apparently it doesn't. Singleton moms probably notice germs to some level, but probably don't obsess about it to the degree that I do. I don't know what it's like not to be afraid of germs, and I really wish I did! Multiples mom or singleton mom...I've pretty much decided that all moms are superheroes in one way or another. We each have our own specific challenges and situations, but each of us want the best for our kids and will take down anyone who stands in our way. Moms are so courageous. That's all I have to say about that. I call myself blessed to have both multiples moms and singleton moms among my friends. Thank you to each one of you for pouring your lives into mine, letting me learn from your situations, and laughing with me as we chat about the silly antics of our kids! I don't think you give yourself enough credit! You would handle a singleton pregnancy, a singleton child, or children of multiple ages with flying colors, I am sure. You are an awesome mom and would adapt to anything, as has been proven. Also, I work outisde the home and have one toddler the same age as yours, and it's not that hard...actually the weekends feel harder, if you catch my drift! ha! But then, I work for a nonprofit, so it's pretty low-key at the job site. Hmmm...now I'm rambling. Anyways, I agree with you: all moms are awesome. But I still think moms of multiples have something special in their hearts. I don't think I could do what you do! Thank you for such nice compliments! I think God definitely equips each mom to handle the kid situation that she is given! Oh, also, I know A LOT of ladies pregnant with singletons who take weekly pictures and even post weekly updates on their blog! I often wonder how you could possible entertain one child all day. That must be why singleton Mom always say "I can barely handle my one, I can't imagine three"
I know! Pre-babies, we had one cat and he got into EVERYTHING. He followed me around, was bored out of his mind, and finally I just couldn't get anything done (he was IN my dishwasher while I was trying to load it, etc). We finally got a second cat after two weeks just so he would have someone to play with. It definitely helped! LOVE THIS! God made every mom unique with the ability to meet the exact needs of the children HE gave her not the children of other families (thanks goodness! haha)! Great post! This was such a fun read! I love how this is your normal and you do it so well! Thank you! And I appreciated the "pin" also! Thank you for sharing to FB! When people share my posts, that is the best compliment ever! That sounds like a fun way to spend the afternoon if it's a showing that encourages parents to bring babies. Whoever came up with that idea was clearly a parent themselves! I was thinking the other day about how God never gives us anything we can't handle. It made me think that He must have SO MUCH confidence in you and Sean to know that you guys could handle raising quads - I don't think most people would be able to! I love my little guy more than anything in this world, but somedays my husband and I are doing good to take care of one (let alone four!). You know, we rise to the challenges in front of us. I would have said the same thing as you about three years ago. We had concerns that we would have twins. ha! But God is gracious to help us through every situation! We certainly aren't perfect parents, but we do the best we can. As a mom of a singleton and twins I will say that singletons are easy in comparison but still not easy. Kinda like Algebra is easy when you compare it to Calculus. I agree that having one child would be exhausting since there is no one to play with. Thanks for weighing in! You have a really unique perspective in that you've experienced both sides of the coin! Having had four singletons followed by twins, I can relate. Other than the pregnancy (that stinks either way) in many way my twins were easier than the singletons. In my case though, I wonder if the twins were easier since I was older and a bit more relaxed about kids and I'd already given up on ever having a clean house again. Goodness, Mama! You are a busy lady! It sounds like there is definitely a learning curve to stress-less about parenting. I'm a much more relaxed parent with four than I ever would have been if I'd had one first. I think it's kind of a necessary thing when that many kids enter the picture! I did weekly photos with both kids! We all adapt as we need to and each set of kids poses their own challenges. People told me I was crazy for having 2 under 2, but I can't imagine having them any farther apart! Yay! Now I don't feel so bad about my "weekly photo" comment to my friend. :) Two under two is rough, but you will do great! I'm so glad, Tiffany! Being a Mama is incredibly tough. Every morning that you get up and keep going shows how strong you are! LOVE this! It is all so very true! I haven't the foggiest idea what it's like to be pregnant with one baby or to raise just one just like not many know what it's like having four at once. I'm glad to be in your company of Quad Moms! I'm glad you are a quad mom too! You run your "quad-dom" wonderfully! You are SPOT ON, Friend! Loved every word! You need to share this in the quad moms FB group! Great perspective! Thankful we are in this together! Thanks, Jen! Maybe I will share it and see what the other quad moms have to say. :) So glad that we are traveling the same road! I have an only so I look at others with multiples and am stunned! I could barely change one diaper, get one child fed and deal with trying to work and balance it all. Kudos to you! Thanks, Deb! But having any number of children is a challenge. I'm sure you are an awesome mother! True, true, true! I just had my singleton after my quads (3 surviving). I was dumbfounded when he came home- when my girls came home from the NICU they were on a reliable schedule. This has been the hardest with the singleton. He eats sometimes every 3 hr, sometimes every hour!!! ahh!!! i have also said to friends of multiple kids that are different ages how that must be so hard. every kid needs something different! with my newborn i am still afraid of germs but only b/c we're having such a bad flu year around here. I am most definitely thankful that the kids came home on a schedule. I'm not sure what I would do if I had a singleton at this point...it would be like I was a first time mom! ROTFL! Your comment totally made me laugh! I'm anything BUT a celebrity mama! I'm just trying to figure out this whole parenting thing like everybody else. :) Thanks for stopping by! Love this Rebecca! And sorry, but the germ thing isn't related to multiples - just some of us parents who hate to have sick kids. My family laughs at me all the time but I still make them wash their hands whenever they walk in the door, get enough sleep and such. And let me just tell you, that whole raising 4 kids at the same time, now that's something I admire! My husband would have fainted and never recovered if I had any number of multiples. It's all a big learning curve for us as parents, isn't it?! Totally a learning curve, no matter how many kids are in the picture. And I'm glad I'm not the only parent who is crazy about germs! Awesome post. There definitely are challenges on each level. In the long run all are blessed to be parents aren't they? 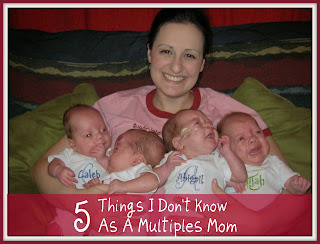 :) Thanks so much for sharing your look into being a mom of multiples. I must admit I find the very idea thrilling. :) Have a blessed day! Thanks for stopping by! I wholeheartedly agree with you! Every parent is blessed to have their baby(ies)! Love this! We all face challenges, but you almost make it sound easy to have four! I do sometimes wish my two would play with each other- and being 19 months apart, I know they will soon, but it is pretty frustrating to navigate the difference sometimes. Thanks for linking up at Sweet C's! You are a busy mom with two kids 19 months apart! Thanks for taking time to read and leave a comment! Precious! Love your life story! I am a mom of an 8 yr old daughter and twin 4 yr old sons. I love being a stay-at-home mom. We, too, had my multiples ealry and appreciated our nurses loving on those boys with us in the NICU. Sure made their ealry entrance to the world smoother. Staying at home with your children provides a priceless impact on them, and I strongly urge other moms to consider it. They are only little for a short time and once the school-years begin, mom's could venture back into the workplace or freelance at home. We have trimmed down our budget to live on one income for years now, and even in this economy, it can be done! Blessings on you and yours! As for your germ anxiety, I'm right there with you, and I thought it was just me. Twins in NICU for a month. And when my boys (now 11) try to rush through a hand-washing today, I give them my speech: "Hey, we had to wash hands for 3 solid minutes every time we saw you. You can wash for 10 seconds." Ha-ha! My experience is that it does make a difference, btw, esp since they do share a lot of things. I enjoyed your blog entry. Keep up the good writing. I'm here to tell you that you will get to the point where your life will remotely resemble your former life (dinners are not chaos, you can go to dinner with friends again, etc.). I think that your writing as a personal outlet and as a skill will serve you well later. Aw! Thanks for the really sweet comment! It's made my day! You are right. Someday my life will calm down...but then I might miss the chaos! I just stumbled upon this blog post and I am in awe of your humility! I have an almost 3 year old daughter and 9 month twin boys. I can't wait to read more of your blog! Thank you.